This article documents the addition of 512 microsatellite marker loci and nine pairs of Single Nucleotide Polymorphism (SNP) sequencing primers to the Molecular Ecology Resources Database. Loci were developed for the following species: Alcippe morrisonia morrisonia, Bashania fangiana, Bashania fargesii, Chaetodon vagabundus, Colletes floralis, Coluber constrictor flaviventris, Coptotermes gestroi, Crotophaga major, Cyprinella lutrensis, Danaus plexippus, Fagus grandifolia, Falco tinnunculus, Fletcherimyia fletcheri, Hydrilla verticillata, Laterallus jamaicensis coturniculus, Leavenworthia alabamica, Marmosops incanus, Miichthys miiuy, Nasua nasua, Noturus exilis, Odontesthes bonariensis, Quadrula fragosa, Pinctada maxima, Pseudaletia separata, Pseudoperonospora cubensis, Podocarpus elatus, Portunus trituberculatus, Rhagoletis cerasi, Rhinella schneideri, Sarracenia alata, Skeletonema marinoi, Sminthurus viridis, Syngnathus abaster, Uroteuthis (Photololigo) chinensis, Verticillium dahliae, Wasmannia auropunctata, and Zygochlamys patagonica. These loci were cross-tested on the following species: Chaetodon baronessa, Falco columbarius, Falco eleonorae, Falco naumanni, Falco peregrinus, Falco subbuteo, Didelphis aurita, Gracilinanus microtarsus, Marmosops paulensis, Monodelphis Americana, Odontesthes hatcheri, Podocarpus grayi, Podocarpus lawrencei, Podocarpus smithii, Portunus pelagicus, Syngnathus acus, Syngnathus typhle,Uroteuthis (Photololigo) edulis, Uroteuthis (Photololigo) duvauceli and Verticillium albo-atrum. This article also documents the addition of nine sequencing primer pairs and sixteen allele specific primers or probes for Oncorhynchus mykiss and Oncorhynchus tshawytscha; these primers and assays were cross-tested in both species. 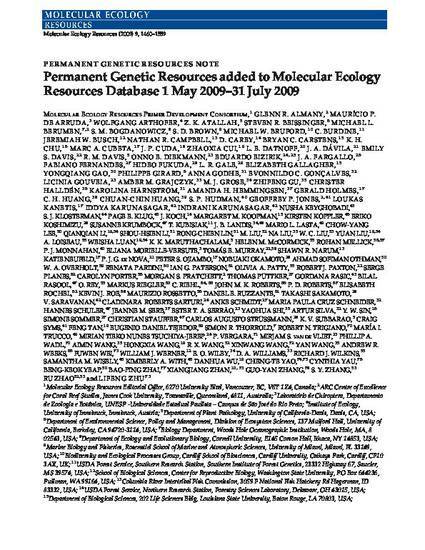 This article is from Molecular Ecology Resources 9 (2009): 1460, doi:10.1111/j.1755-0998.2009.02759.x.